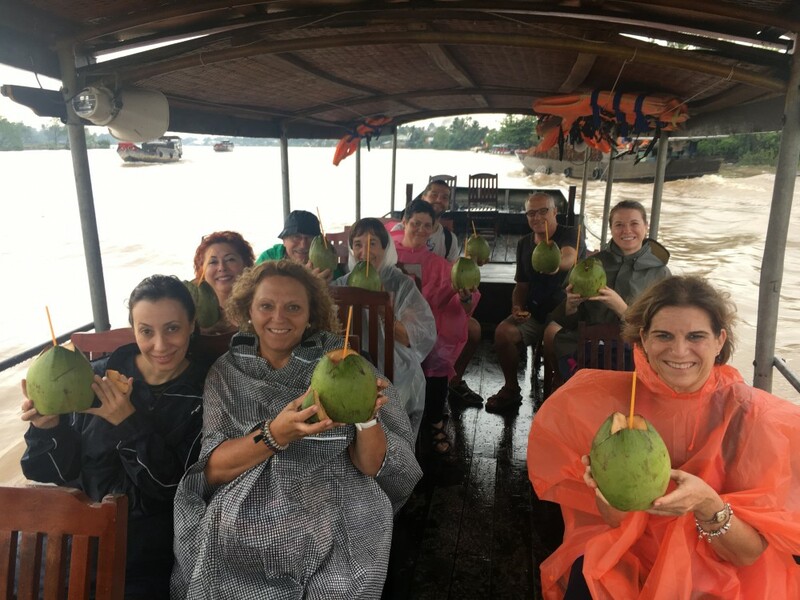 Taste local food tours are the perfect way to explore and dive into Mekong Delta and make you feel like a local. 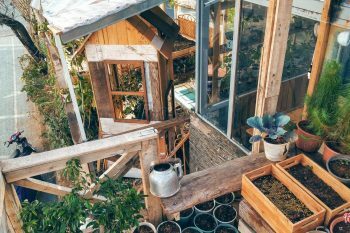 Mekong Delta 1 day tour will feel like you are walking around with your friends who together go to all the best food shops in town talk about the interesting taste about the food, the people and the beautiful landscape. Best 7 things to eat and drink in Mekong Delta will help you to decide how to find the best food and drink in Mekong food tour. This is one of the most famous noodle soup during Mekong Delta tour 1 day that we couldn’t stop mentioning it. 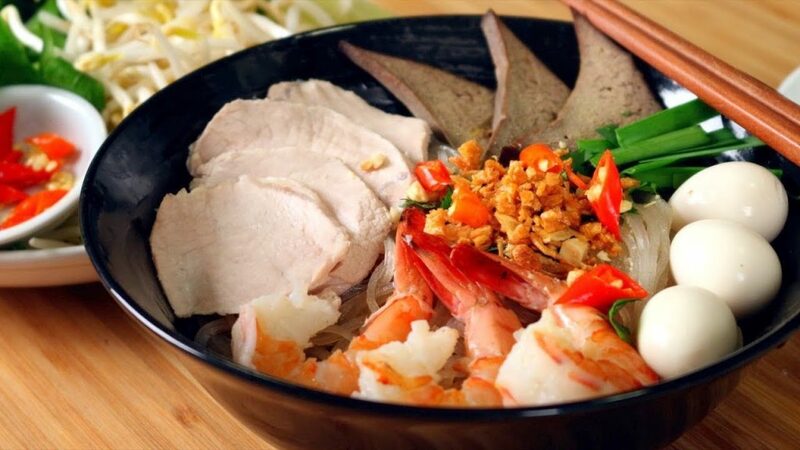 Solely a bowl of noodle soup consists of rice vermicelli topped with several chunks of crispy pork, slices of squid, a juicy prawn, raw vegetables, white thick noodles and herbs, and covers in the pungent Mekong Fish Mắm to serve the customers. And the true way to have a taste of Mekong in a specialist bowl. You’ll find yourself finishing the whole dish on your own and make your thump up as well. If you’re that kind of person prefers a wide array of choices and want to have food together with your friends while you are traveling. 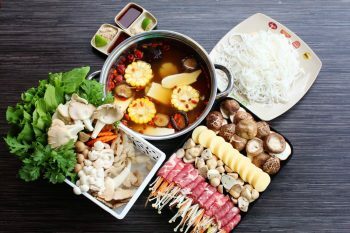 Lẩu mắm (Mắm Hotpot) will address your great idea for this concept. You should do that get a table and be waiting for a variety of broths cooked from coconut water, pork bone and macerated fishes. They also will have a wide range of Mekong ingredients such as “Điên Điển” flower, Giọ Mùng (Dropwort), bean sprouts, spinach water, straw mushroom for you to add into your boiled soup. The vibrant, hot salted fish soup, a medley of flavors spicy, bitter, salty-sweet and pungent of Lau Mam here is no joke. Definitely, one of the best dish in Mekong 1 day tour you must grab. Hu tiu My Tho is considered to be one of the cuisine symbols of the Mekong river with influence from Cambodia, Chinese recipe and mix with Vietnamese taste. It is a fine example of all good things come in a bowl to serve the customers. 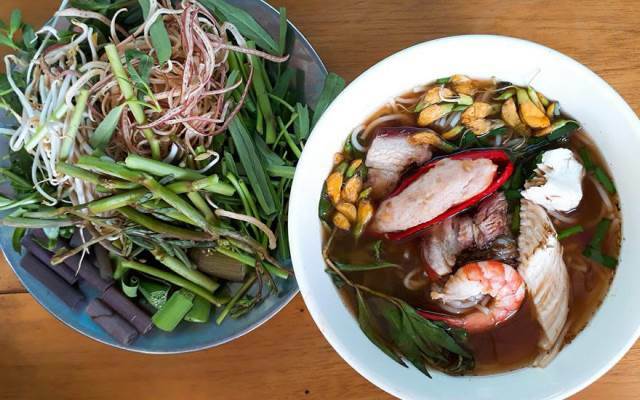 This noodle soup is a very popular street food and boat food in the Southwest region of Vietnam. In others words, Hu tiu is very rich and tasty cooked with pork bones and dressed up slices of pork, dried squids, fresh and dried shrimps, quail eggs and veggies. Other than that, if you are looking for something lighter during Mekong tour 1 day, Hu tiu My Tho will be your perfect choice. In fact, you can only find special Banh Tam Bi only in the best Mekong Delta tour 1 day. And, you will get in your mind that you find a very new food and it’s absolutely delicious though. Locals here make a plate of Banh Tam Bi consists of rice and tapioca thick noodle look life silkworms, slices boiled lean pork, shredded boiled pig skin mixing with roasted rice powder. 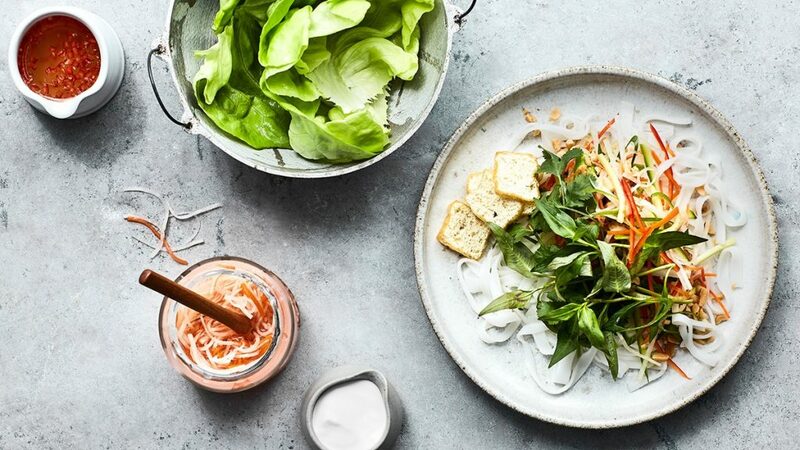 In addition, a bowl of Banh Tam Bi will be appearances with a combo cooked coconut cream, fish sauce dip made from fish sauce, coconut water, garlic, chili, lemon juice and fresh vegetables such as bean sprouts and herbs. Let have a seat, eat it slowly so you can feel taste salty, sweet, sour, hot taste blending in your mouth. 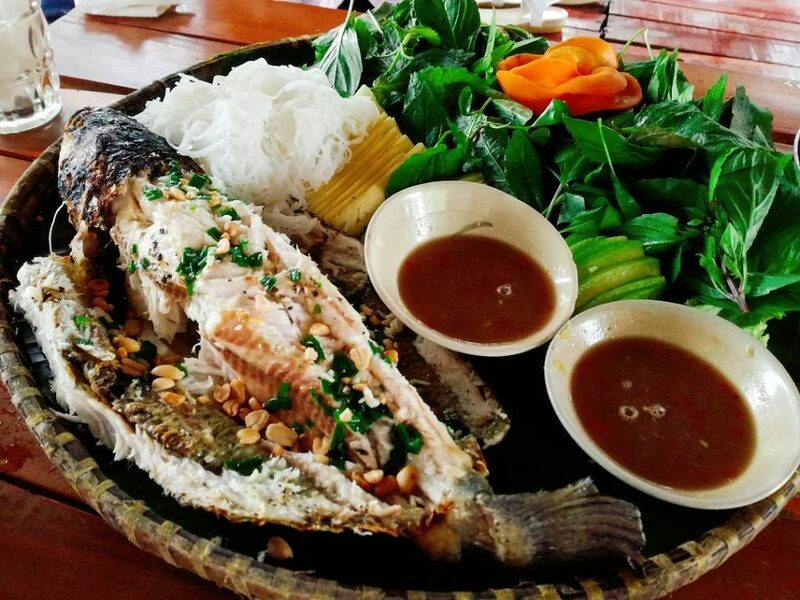 Grilled Fish is one of the most delicious foods with a wide variety of fresh fishes and taste crunch from Mekong river that you must try. The grilled fish is sure to impress on your tabe, bursting with the taste from garlic, chili, pepper, salt spreaded in fish skin. Then, having with rice noodles, some kinds of vegetables of cucumber, green banana, herbs and starfruit followed by special sauce. It is on a promise that you will love them because of so much flavourful and healthy. 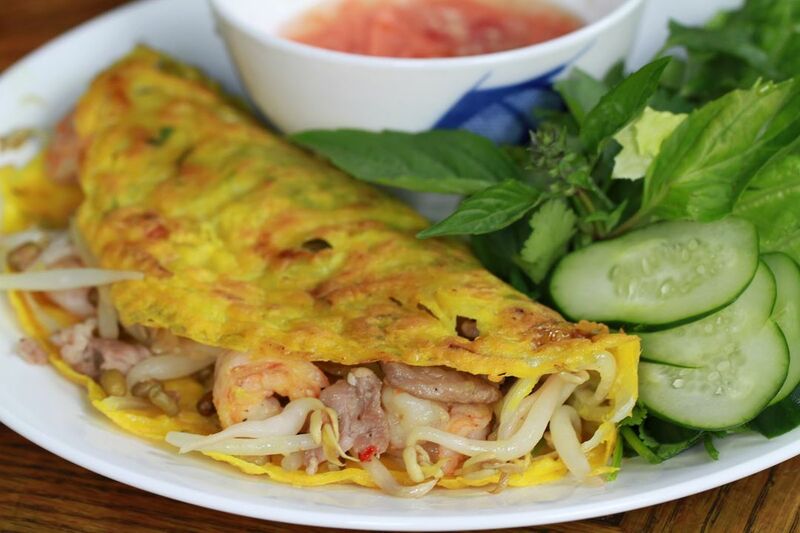 Bánh xèo is not only the famous Vietnamese Pancake but also originally comes from the Southwest region of Vietnam. It is a yellow crispy pancake stuffed with shrimp, pork and bean sprouts. The crispiness comes from the rice flour mixes with coconut liquid ingredient and the yellow comes from the turmeric powder. 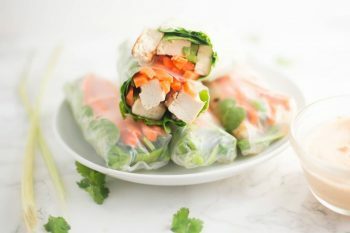 You can eat Banh Xeo with various herbs and large lettuce which keep balancing between the fatty and freshness and dip into the sweet, sour, hot fish sauce makes. Literally, you will find all the taste of agricultural products from Mekong land. Last but not least, coconut water is a very popular beverage with the typical taste of tropical fruit and summer. Coconut water naturally has a sweet and nutty taste. It is also a very healthy water because of being less sugar than many kinds of soda and fruit juices. Mekong Delta is as know as the land of the coconut, for this reason, you will easily grab it in your Mekong Food tour and it’s cheap. Food and drink are undeniable in Mekong Delta. More interesting, you should try 1 day Mekong river cruise to understand the “floating” life of the locals. Everything happens on a boat from transportation to trading.